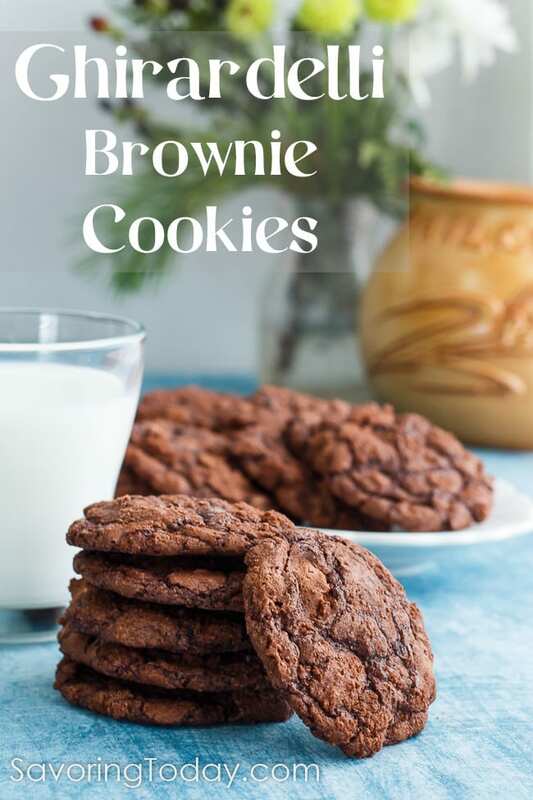 Ghirardelli Brownie Cookies made with brownie mix saved me from a trip to the store when I was short on ingredients for my usual cookie recipe. Whether you love gooey brownies or chewy edges, this recipe will show you how to get just the results you want. When our youngest started attending high school, I decided to bake cookies on Fridays for her to have when she got home from school. It was our special time together to linger over a cup of milk and warm cookies as we talked. I would make the standard chocolate chip (her favorite), snickerdoodles (my favorite), oatmeal, chocolate cookies with mint-chocolate chips, or the occasional peanut butter just to keep things interesting. One Friday, I noticed there was not enough flour in the house for even half a batch. Out of time to get to the store, I remembered my friend Donna’s cookie recipe that she makes from a cake mix. I had Ghirardelli Brownie Mix in the cupboard and it worked like a charm—Ghirardelli Brownie Cookies were ready, right on schedule! If you’re a fan of the chewy edge pieces lining a pan of brownies, you’ll want to follow the cooking time of the recipe just as it’s written. If you’re more of the gooey middle brownie lover, reduce the baking time by 1 minute and see if that is closer to the brownie cookie you dream about. Any 18 ounce brownie mix should work for this recipe, though I highly recommend Ghirardelli. NOTE: If using a 20 ounce mix, omit adding the extra flour and test 1 cookie in oven for shape. If the cookie spreads too much, mix-in 1-2 tablespoon of flour into the dough and retest. One 18 ounce mix will make 3 1/2 dozen, 2 1/2-inch cookies based on .80 ounces of dough per cookie. Make ahead tip: Bake as directed and freeze for up to 3 months. Shared with someone, they taste even better! You’ll notice I use coconut oil in this recipe instead of vegetable oil because it is a healthy oil and performs beautifully here. In fact, coconut oil is one of the three main cooking fats (coconut, butter, extra-virgin olive oil) I use and substitute for any vegetable oil called for in baking and stir-fry recipes. Depending on the room temperature, you may have to melt the coconut oil first (it is solid at about 68°F). I also use whole wheat flour instead of all-purpose because that’s what I keep on-hand. 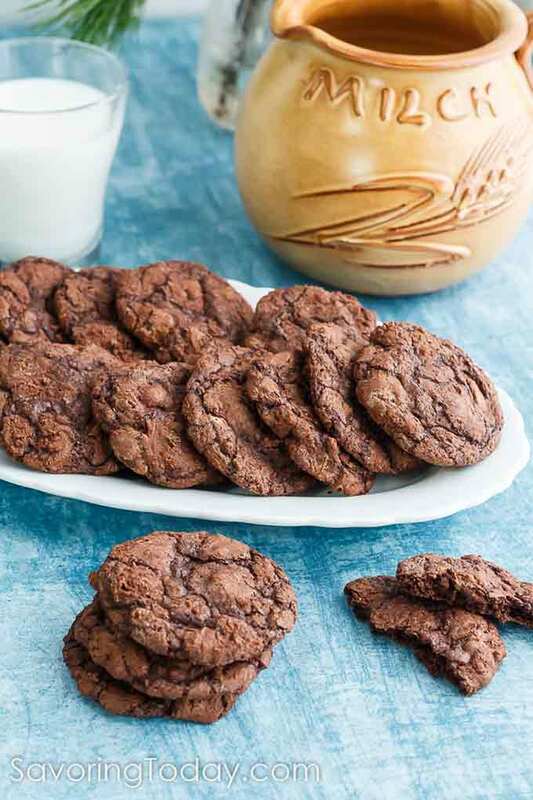 Soft, chewy cookies made with Ghirardelli brownie mix. Heat oven to 350°F. In the bowl of a mixer, stir flour into brownie mix until well incorporated. In a separate bowl, slightly beat eggs with the coconut oil and add to the mix along with any add-ins. Mix on low speed until the flour is moistened. The dough should be stiff like cookie dough. Place the dough in heaping tablespoons (about .80 ounces each) in on a parchment-lined baking sheet; this amount will spread to 2 1/2-inches when baked. Bake for 10 minutes and allow the cookies rest on the pan for 2 minutes after removing from the oven. Remove from the pan and cool on baking racks. If you're a fan of the chewy edge pieces lining a pan of brownies, you'll want to follow the cooking time of the recipe just as it's written. If you're more of the gooey middle brownie lover, reduce the baking time by 1 minute and see if that is closer to the brownie cookie you dream about. Any 18 ounce brownie mix should work for this recipe, though I highly recommend Ghirardelli. NOTE: If using a 20 ounce mix, omit the extra flour and test 1 cookie in oven for shape. If the cookie spreads too much, mix-in 1-2 tablespoon of flour into the dough and retest. If you try it, please rate the recipe and let me know how it went for you in the comments below. I made these just as you said. I did smell them baking…I remember the cooling rack but, where oh where did they go? My family is walking around with milk mustache smiles so, maybe I do know where those cookies went. Hi Jeanne! Your comment made me smile. 🙂 Thanks for letting me know your family enjoyed the cookies so much! I can just imagine those milk smiles. I would love to make some brownie bunny cookies for Easter. Any ideas on how to adjust the recipe In order to roll the dough for cookie cutters? Some websites suggest cutting the shapes after baking brownies, but that seems to leave a lot of scraps. I’m assuming that increasing the amount of flour might help, but would love to know your thoughts. Hi Pat! Wow, that’s a great question. I haven’t tried making shapes like that, but I have to agree with the idea of cutting them after baking. While it would produce scraps, they’ll taste the same and you could freeze them for ice cream toppings. 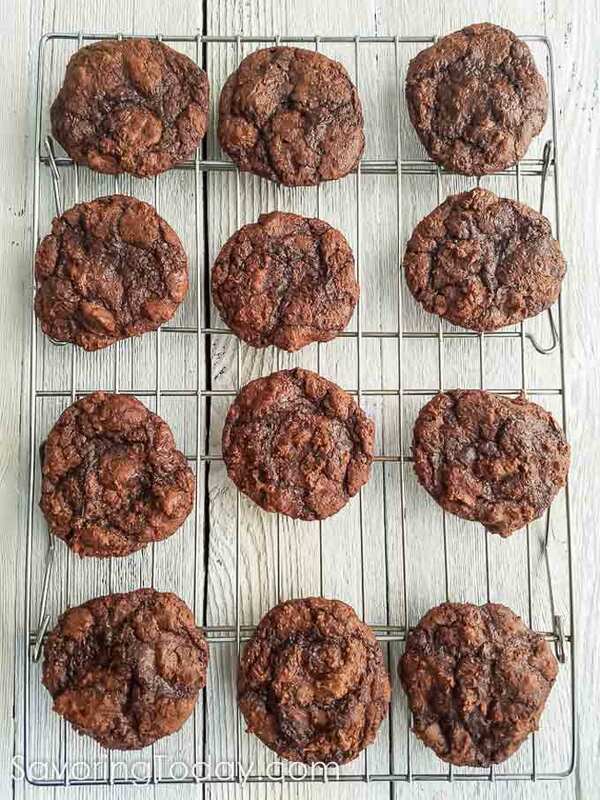 🙂 My other suggestion if you really want to try to roll them out, would be to mix the dough and then work with a small enough amount to make 1 or 2 cookies with a little bit more flour. Add only enough flour to be able to pat the dough out rather than rolling (I think rolling would compact the dough too much), and do it on top of a piece of parchment paper to make it easier to move the cut cookies to a pan (less likely to stick). Ultimately, use those one or two cookies as a test before trying it with the whole batch. Let me know if that’s helpful or if you have any other questions! You can also reach me through messenger on Facebook if you need quicker answers. 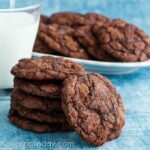 I’m a big fan of Ghirardelli’s Triple brownies & was so happy to find your cookie recipe. I have been substituting no-sugar-added applesauce for most of the oil when making the brownies. (I use one 4 oz. individual serving cup of applesauce, scoop out a generous tablespoonful & fill the remaining space in the cup with coconut or canola oil). Do you think this strategy would work for cookies as well if I added the extra flour per your modification? I love these, because of the ease of them ! I did bake them 11 minutes..
Wow, these are really good! I used melted butter for the oil and sandwiched them in pairs with a microwaved large marshmallow between while everything was still warm (have to move relatively fast on the marshmallows). Very quick and easy! Ghiradelli has changed their brownie box size (at least the Triple Chocolate kind) from 18 to 20 ounce boxes. Have you altered anything else in the recipe to accomodate this change? Thanks in advance! Hi Sue, thanks for catching that! This change must have happened in the last 6 months since I updated this recipe, so I haven’t tested it with the 20 ounce package. However, just glancing at the recipe, I would reduce the added flour by half (to 1.5 or 2 tablespoons) to see how it mixes up and then add a little more if the dough ins’t stiff like cookie dough. Also, it’s always a good idea to bake 1 cookie as a tester and add more flour if it spreads too much. Again, thanks for bringing it up, I’ll have to get a test batch going myself! Can I make this eggless? What can I use instead of egg. I would love to try these. Please let me know. I have not tried it myself, but I know several bakers who use a flax seed powder and water substitute for egg. You can grind 1 tablespoon of flax seeds (or 2 1/2 teaspoons ground flax meal) and mix with three tablespoons of water to replace one egg. Whisk the two together and until it becomes gelatinous. Add the mixture in place of the egg in the recipe. Hi, just checking, have you tried making some of these cookies with Choco Liqueur? Planning to make some but not sure if the texture will change. Thanks. I have not tried adding liqueur to the cookies. If your adding any liquid the texture is sure to be affected, but you won’t know until you try it. You can try mixing the batch as directed and then adding a small amount to one cookie and baking a tester. That will also let you know if the liqueur has the effect you’re looking for. There is so much chocolate flavor in these cookies, more chocolate may not be noticeable. However, instant espresso is great for accentuating the flavor of chocolate and making it taste deeper and richer. Hope that helps! Omg is my boyfriend going to LOVE me!! These turned out like big fat bakery cookies. Absolutely fabulous! I love these cookies!! Thanks so much. I first baked them for my husband (of course I ate most of them). Then I baked them for a charity tea. A huge hit. I have shared the recipe with my sister who will make them for her grandkids. They are quick to make and soooo delicious! I used to buy refrigerated chewy cookie brownies from a favorite bakery & “almost” landed their recipe years ago. But failed!! (I should have known it would not be so easy!😏) But now thanks to you I found this one! Thank you! One question, I googled “refrigerated” do you happen to know if they can be refrigerated & not become too hard? I’m so glad to hear you love the cookies! As far as refrigerating them, I’m assuming you mean refrigerating the dough to be ready to bake fresh? The answer is, yes. Shape the dough into a log and wrap in plastic wrap to keep it from drying out. Then slice and bake when ready. You can also freeze the cookies in an air-tight bag to store for a quick treat — some even like them straight from the freezer! My son’s wife is a wonderful cook, everything from scratch, perfect—me, kind of hit and miss. This recipe came out perfect–and I really needed it to. Thank you! Margo, you made my day! I am so pleased the recipe turned out exactly as you needed it to and just when you needed it to. Thank you for taking the time to stop back by and let me know. What a great way to use up a brownie mix I had laying around! thank you for this recipe. For anyone else reading, yes, the vegetable/canola oil does work, but I wish I had used coconut oil. The vegetable oil leaves a bit of an aftertaste, one that I associate with box brownies, which I didn’t love. I’ll splurge and get the coconut oil in there next time. Oh, and I added white chocolate chips in and sprinkled sea salt on top. Super good! Brilliant. 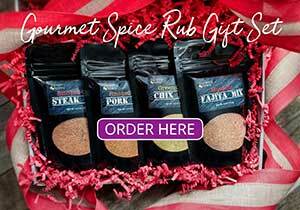 For those of us who love a salt-sweet combo, the sea salt is a WIN for sure! Bethany, thank you for stopping in to let me know you loved the recipe! And I think if you use coconut oil on your next batch you’ll love it even more. Chocolate chips, caramel bits, and chopped pretzels – YUM!! I bake the same amount of time and probably add about 1/3 cup each. Hi Chris, thanks so much for taking the time to stop back by and let me know how they turned out for you. Caramel bits and pretzels with chocolate chips?! Oh my, that sweet, salty, crunch is a favorite for me so I’d have to be very careful with those –too good! I live in a small town and bake cookies for voters to enjoy when they come into vote. The brownie mix recipe saved the day so I didn’t have to drive to get ingredients when I realized I’m out of time. Based on the comments, I decided to add 6 tablespoons of flour instead of 3-4, and I used Crisco oil because I had it. I made the cookies 1/4 oz each and baked 35 per sheet for 7 minutes. At about 1 1/2″ in diameter, they are chewy and delicious. I will definitely make these again! Wonderful cookies. I used butter, because I like the richness it adds. I made a double batch and they quickly disappeared. This recipe has been added to my list of “cookies for grandchildren”. Hi Valerie! Oh I love that — cookies for grandchildren — I’ll bet they love coming to grandma’s house! I made this savor but instead of 4 Tbs of flour i used 2 and for the rest i used millet flour to make them more healthy, they turned out yummy but a few hours later the cookies became hard I don’t know why, plz can u advice how to keep them crunchy and soft? Hi Miriam, I haven’t used millet flour to make them, so I can’t be sure if that is why they hardened. It could also be baking time — it’s harder to tell if dark cookies are done enough by site — so reducing bake time by even a minute could make a difference. I do know a trick to softening cookies is to put a piece of sandwich bread or a slice of apple in the container with them for a few hours. Also, how they are stored can make a difference — cookies stored in a jar (not airtight) will be dry while storing in a plastic bag or airtight container can help keep them softer. Well I just looked at the recipe and noticed it said “chocolate bars” in the ingredient list … that was weird and I don’t know where that code came from, but it is FIXED now. I hope that wasn’t what threw you off. The batter should be thick, but not crumbly. Give me just a little more information so I can help you problem solve. What brand brownie mix and what size did you use? Awesome cookies!!!! On my second batch…thank you so much for sharing. I was craving cookies and staring at this box of brownie mix…I knew it would be a simple modification or two to turn it into a dough. Excellent advice on how to do that. Your coconut oil choice reminded me that I had coconut flour I hadn’t had a chance to use, and when I couldn’t find additional chocolate chips…walnuts and M&M minis went in to the batter. The absence of water meant that the shell shouldn’t dissolve too much. They are awesome…Like a hint of brownie edge in every bite… Thank you!!!! Looking forward to trying out your other recipes. Wanted to boost the three star rating up! Hi Jim! Thanks for stopping back by to let me know about your creative adjustments and how much you liked the cookies. These cookies sure do satisfy cookie cravings! Can i add peanut butter somehow into the recipe, not in chip form? Hi Danita! That is a fabulous flavor combo, but one I haven’t tried. However, if I were going to try such a feat, I’d mix the dough as described and then test one cookie with like a teaspoon of peanut butter added just to that cookie, mixed or in a streak, however you want. Bake it and see what you think. Keep in mind that, in general, when peanut butter is added to sweets/treats, it is mixed with a little salt and sugar to boost the peanut butter flavor which can taste flat when baked. Yes, salt and sugar make peanut butter more peanut-buttery. So if you try the plain and decide it wasn’t quite as wonderful as you hoped, then mix 1/2 a cup or so in a separate bowl with a little salt and sugar (the sugar will also help stablize it) until you taste it and LOVE it. Then mix it into another test cookie and bake to see if you like that better. If so, swirl it into the dough in ribbons and bake. I would imagine 1/2 cup or 2/3 cup of the peanut butter mix would be enough for one batch and I would reduce the amount of chocolate chips by 1/3 to 1/2 cup based on the ratio when I look in the bowl. Gosh, I hope that helps! Please, let me know how it turns out! Could I used vegitable oil instead of coconut oil? I don’t like coconut oil. i used your recipe and added red & white peppermnt m&m’s. they were yummy! Oh Teresa, I’d love to see a photo of those ~ great for the holidays. 🙂 Glad you liked them! I have never used coconut oil so is it supposed to be solid when I mixer in or do I melt it? And do I measure it when it’s solid or liquid? The coconut oil should be melted or at least very soft so it will mix in without leaving clumps. You can measure it before or after it is melted, it is up to you and what you find more convenient. Sometimes if the room is cold, it is easier to melt or at least soften it first. The batter will be sticky and if you are not at high altitude, you shouldn’t need more than 1/4 cup of flour — once cooled they should have a chewy texture like a brownie. In my research, the shiny aspect can be attributed to either the sugar and egg making the right amount of contact when stirred or the simple addition of the chocolate chips. If you are already adding the chocolate chips, try stirring the batter longer. And if they are puffing up too much, you might try gently pressing them out a little after putting them on the pan to see if that helps the shape. Let me know if any of this helps! Thanks so much for this recipe!! Having a few guests over and needed a quick desert! They turned out lovely,I also added white chocolate chips! Carla, you are so welcome! 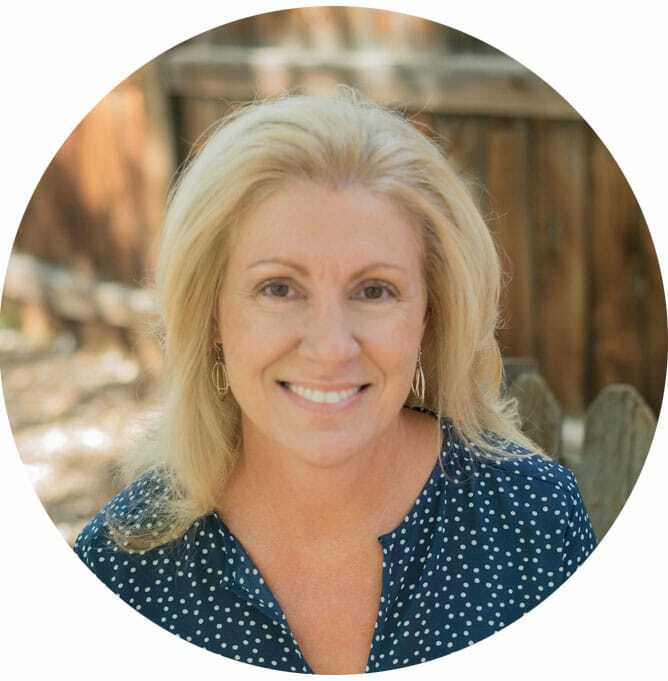 Thanks for taking the time to stop by and let me know how much you loved them. What type of ghirardelli mix do you use? The triple chocolate one I get already has chocolate chips in it. Does the one you use? Do you add more chips? Is there anything you can substitute the coconut oil with? I don’t have any on hand. Hi Susan, you can use any light tasting oil (avocado would be a healthy choice, olive oil would not taste right) or butter. Hi! I was wondering what size cookie you made, because it looks delicious! I want to bake it for the correct amount of time, and I like slightly large cookies (large palm size) but I don’t know how much these spread. Thank you! Thank you so much! I will do that! I just finished making these, and not only are they inexpensive, but incredibly quick to whip up and crazy delicious. I used a Betty Crocker mix and 1/4 cup of flour, and added walnuts to half the batter, and a mixture of chocolate & butterscotch chips to the other half. I can’t stop eating them. 🙂 Thanks so much for the recipe! I am not a cookie fan (that doesn’t mean I don’t eat them, I just don’t CRAVE them) but I think my wife would love these. I’m going to surprise her with a batch. I’ll let you know what she says.